In the earlier volumes of this Series (nos. 1 to 7), the former four specialised branches have already been described. The present volume deals with the .remaining four specialised branches. 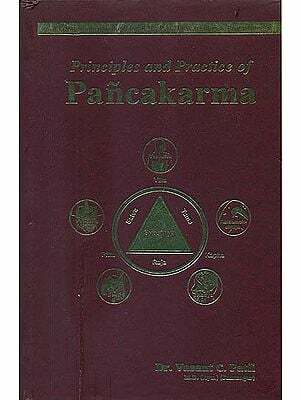 In addition, a group of five specialised and classical therapies called Panca-karma are also described in detail in this volume. Procreation is a normal physiological process in all living beings I including human beings, animals and plants. But animals and plants, because of their sublatent and latent mental faculty are incapable of exercising their power of' discrimination and indulge in sexual union as a matter of natural instinct. As a result, they procreate off springs which may be useful or harmful and healthy or diseased. On the other hand, humanbeings are endowed with' the power of discrimination, fully developed mental faculty and wisdom. Being a social animal, they instinctively do not desire to have a child who will be a liability to themselves and harmful to the society. To procreate a healthy child who will be an asset to their family, society, country and humanity as a whole is in their own hands. It is left to them if they want to use this naturally gifted power or' not. The present day disorder in the social fabric of Man which has culminated in crime, violence, terrorism, abuse of drugs and AIDS is the' result of his misuse of his power of discrimination. Ayurveda stands for a healthy and peaceful society, and therefore, has prescribed several dos and don'ts for procreating a healthy and socially useful off springs, While taking care of the child, it is necessary to take care of the mother and her ailments. These measures are described in the Chapters I to VII of this volume. 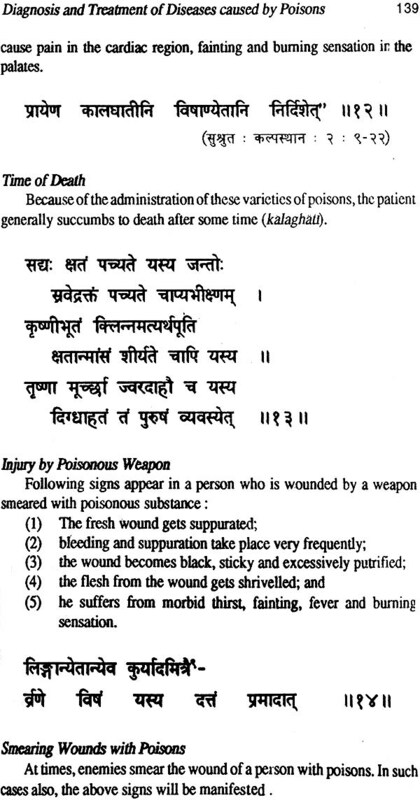 In nature, some plants, animals and metals including minerals are provided with such properties which when used indiscriminately produce harmful effects on the human body. These substances are poisons. Some other substances, though non-poisonous in nature, produce adverse effects on the human beings because of some physico-changes, they undergo as a result of exposure to rain, sun, etc. At times, human beings misuse their power of discrimination and indulge in rivalry. They want to inflict injury upon their enemies and artificially prepare poisonous stuff. Therefore, a person, specially a Ruler should be careful about it. 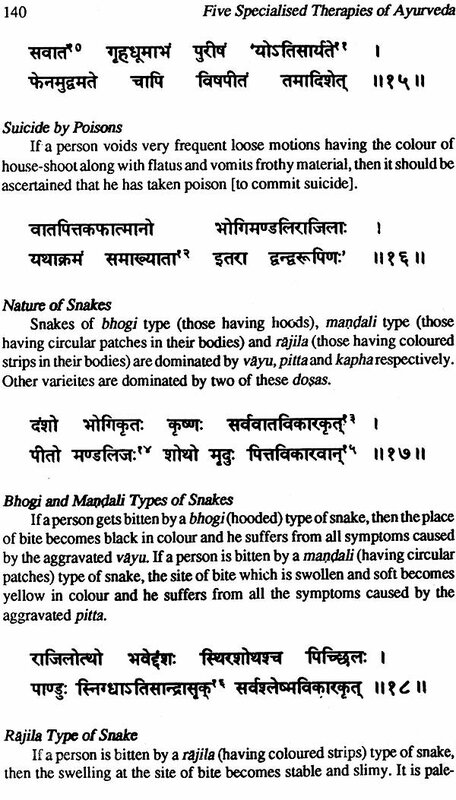 If such poisoning effects are inflicted in spite of all precautions, then the ailments are to be treated by the Physician. These are described in the Chapter-VIII of this volume. Diseases, when already manifested, are no doubt to be treated. But what is important from Ayurvedic point of view is to prevent occurrence of such diseases. According to Ayurveda, simple freedom from disease is not Health. For a person to be called healthy, he should be mentally and spiritually happy. Death can not be prevented. But what can be prevented is the invalidating old age which impairs the sensasory and motor functions of the individual and which leads to several diseases like Heart disease, High Blood pressure, Cancer, Asthma and Arthritis. A person should not be a liability to the family and society during his old age but should be an asset with his accumulated experience. To prevent the aging process and to preserve as well as promote his positive health certain measures are prescribed in Ayurveda. 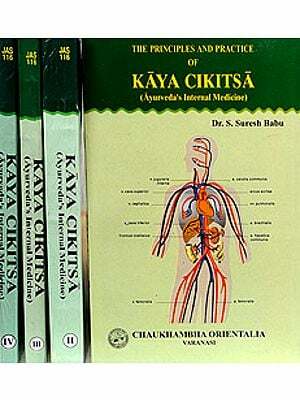 These Rastiyana or Rejuvenation therapies are detailed in the Chapter-IX of this volume. To take food for enabling the body to function, to sleep for giving rest to the body and the mind, to defend himself from injuries and evil designs of others and to have sexual union for procreation and satisfaction of the carnal desires are the natural instincts of all living beings. If a person fails to satisfy the sexual desire, he leads a miserable life and ultimately loses interest in his life. This gives rise to several family and social problems. Timely use of Aphrodisiacs and proper management of the geriatric problems are the sine qua non for a healthy and happy society. 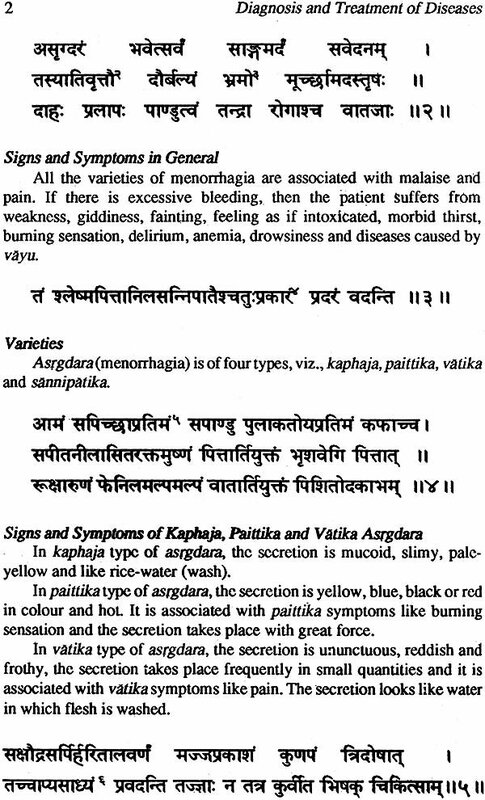 The specialised branch of Ayurveda dealing with such problems and their remedies is called Vajikarana-tantra. It is elaborated in the Chapter-X of this volume. 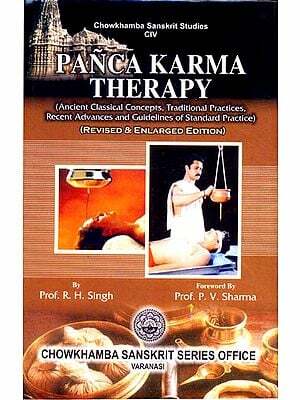 Six Specialised Therapies, called in Ayurvedic parlance Panca-karma, play an important role in Ayurvedic therapeutics inasmuch as even one of these, viz., Basti or Medicated enema therapy is described in Caraka samhita as half of all the therapeutic measures described in this system. Apart from curing several obstinate and otherwise incurable diseases, these specialised therapies are capable of rejuvenating the body for preservation and promotion of Positive health and prevention of diseases. 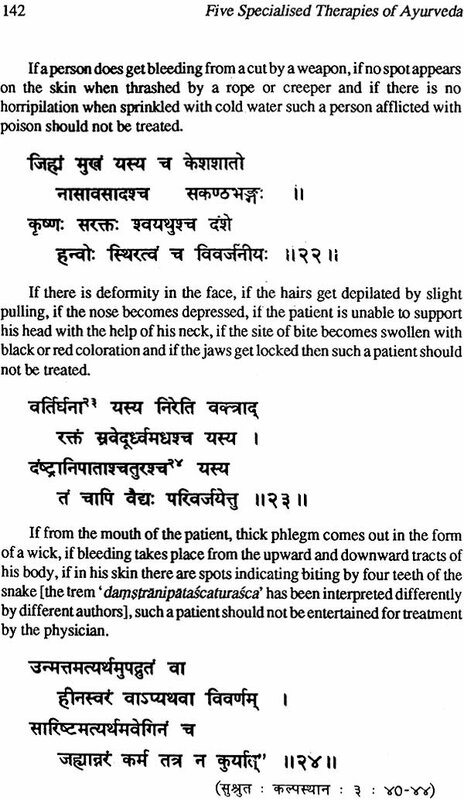 Susruta of the School of Surgeons, has replaced the fifth one by Rakta-moksana or Blood-letting therapy. Before administering these therapies, the body of a person has to be specially processed to accept these therapies for obtaining excellent results. These are called Purva-karma or Preparatory measures. 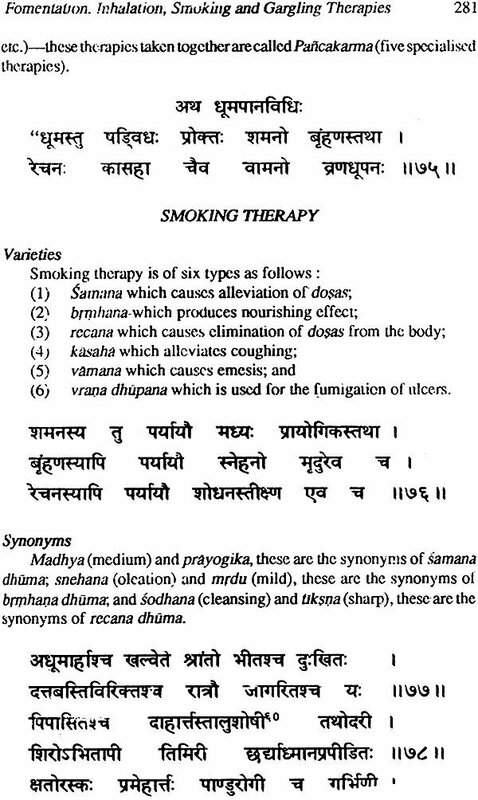 These include snehana or Oleation therapy and svedana or Fomentation therapy. In addition, several minor but important therapies like gandusa or gargling therapy arc also included in this category. All these are described in the Chapters XI to XVI of this volume. 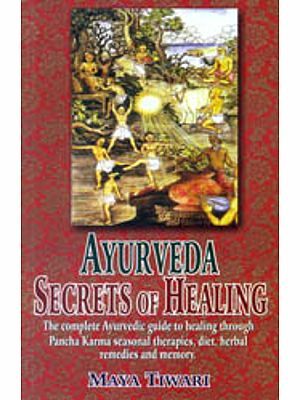 Because of the importance of these "Five Specialised Therapies of Ayurveda" in practice, the title of the present volume is designed accordingly not withstanding other topics included in it. The Chapter numbers of this volume, like the previous ones, are given by, us. Different manuscripts of this work, we have consulted, have different chapter numbers and these are furnished' in the foot-notes and colophons of each chapter. As we are coming to the end of this Series, gradually, we are facing more and more of grammatical and syntactical errors in these manuscripts. Within limits, we have made efforts to correct some of these, and some others are intentionally left out untouched for fear of unauthorised interpolations. This is not a literature but a scientific work with practical implications. With all humility at our command, we therefore, seek the indulgence of our esteemed readers. 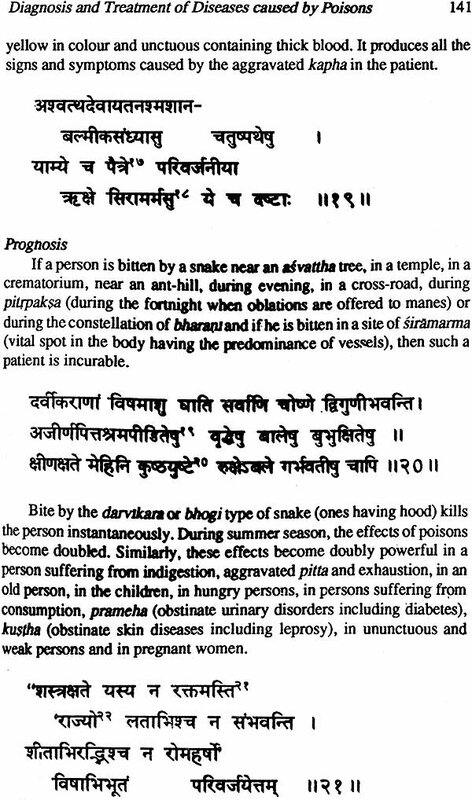 Todaramalla, the author of this work was a versatile genius and had the unique privilege to collect the most authentic and time tested recipes and therapeutic measures. He had at his disposal the services of reputed scholars and libraries to compile and interpret textual material. Because of the wealth of material contained in it, this volume will be equally useful for Ayurvedic physicians, doctors of Modern medicine of this country as well as abroad and for the research workers in the fields of health and humanities.